Check out all the stops on the tour here! What inspired you to write I Heart Robot? A combination of things. There was a scene in Terminator: The Sarah Connor Chronicles which had a huge impact me on the time – when the android, Cameron, starts doing ballet – and that idea of humans having art, of making art for art's sake made me wonder how or if a robot could be a musician. I've also always wanted to write specifically about classical musicians so my own passion for music inspired these characters as well. And lastly, the seminal works by Asimov made me wonder what would happen if robots didn't have to abide by Asimov's laws and what the consequences might be for society if there was a sort of robot liberation movement. 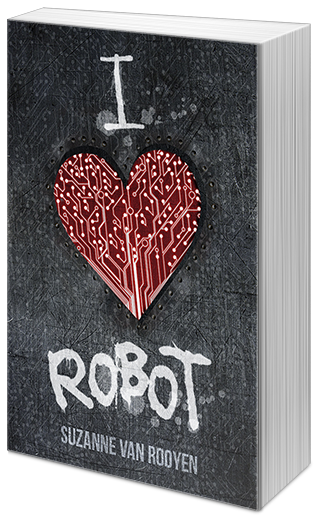 What were your three favorite things about writing I Heart Robot? Firstly, the music for sure. Getting to draw from my own experiences playing in orchestras and writing about pieces of music I personally love was definitely on of my favourite things about I Heart Robot. I also really enjoyed the setting, creating a futuristic Scandinavia after having lived in Finland and visiting the other Nordic countries. And lastly, my favourite thing about I Heart Robot was creating my androids and getting to tell the story from Quinn's perspective, really exploring what it means to be human. What was the most challenging part about writing I Heart Robot? Remembering the tech aspect especially when writing from Quinn's perspective. Showing emotion when your character doesn't have a stomach that can fill with butterflies or breath that can be held was a challenge simply because all those go-to phrases weren't going to work. This challenged to find new and different ways to convey emotion. If I Heart Robot had a theme song what would it be? Sing Me Your Scars, a speculative short story collection by Damien Angelica Walters – it's macabre but brilliant. Hmm, this looks like an interesting read. Then again, I do love robots..